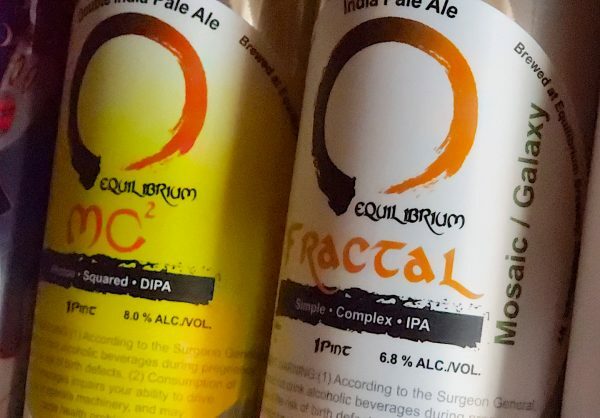 MC2, Fractal Mosaic-Galaxy, Equilibrium Brewing Oh, How the Hop has Turned! IBU has been an important craft beer label initialism for a number of years. It stands for International Bittering Units and it’s a numerical score that indicates (you guessed it) bitterness. In the beer world, the higher the number the more bitter the beer. Scores of 25 might represent a mild bitterness while a score of 100 or more might indicate a face-puckering bitterness. As a side note, bitterness isn’t limited to hop-heavy beer as stouts using roasted grains or coffee also present a bitterness. Over past four to five years, the beer world has seemingly turned 180 degrees. Pushing the limits of 100 + IBU ales has given way to the pillowy soft juicy experiences of New England style IPA. Many brewers today forego the addition of bittering hops in the kettle in favor of a post-boil dry-hopping. While the boiling wort releases the bitter alpha acids found in hop oil, dry-hopping or late addition hops allow for a different hop experience. My trip to Equilibrium last summer. This entry was posted in All Beers and tagged Equilibrium Brewing, Galaxy, IBU, IPA, Mosaic, New England Style IPA by Administrator. Bookmark the permalink.